My friend in Tokyo dropped by my place on his way to hometown visit in the new year vacation, and we went to the beach. Approximately 300 to 400 gram of glycogen is stored in the body's total muscle, and about 70 to 100 gram of glycogen is stored in the liver. Muscle glycogen is a more important energy source than is liver glycogen during moderate-and high intensity exercise; liver glycogen appears to be more important during low intensity exercise. At relative intensities of exercise above 60 % of maximal oxygen uptake, muscle glycogen becomes an increasingly important energy substrate; and the entire glycogen content of some muscle dells can become depleted during exercise. NSCA's essentials of personal training, second edition. It's Christmas and many of my online language training partners are taking off, however, luckily one of my usual practice partners were in. She said " we cerebrate Christmas on January 7th in orthodox churches ". Thanks to her, I learned their religious culture as well as language training. 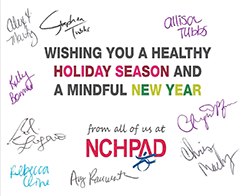 This is a seasonal greeting I got from National Center on Health, Physical Activity and Disability, which is one of my certifying bodies. So, I would like to share it with you guys as a Christmas greeting from me. Have a nice weekend everyone !! the importance of slowing down and relaxing. It's important to continue to establish trust & rapport in each and every coaching session. Trust & rapport are not earned in a single moment. They are earned or lost during every moment of coaching sessions. If coaches are hurry to " get down to business ", trust & rapport will be compromised or lost. Coaches need to set aside the time to have a relaxed-and relaxing-presence with clients. Even when appointments are scheduled back to back, it is important to slow down, be completely present, and savor every moment with each client. Moore, M., Jackson, E., & Tschannnen-Moran, B. (2016). Coaching psychology manual, second edition. One of important points for those who are engaging in teaching/instructing profession is setting a comfortable pace of learning for participants. I had been looking for some appropriate English word for Japanese expression " Ikigai ", and I came across a word that just matches it in an exam prep document for behavior modification. That phrase is " a sense of meaning and purpose in life ". Have a good day today as well, guys ! 「生きがい」という言葉にぴったりくる英語の表現をずっと探していたのですが、なかなか良い表現が思いつかずにいました。本日、ウェルネス・コーチング関連の資料を読んでいて、こんな表現に出会いました。" A sense of meaning and purpose in life "
Although the following link is written as a fitness test for military personnel, this program is good for strength & conditioning of athletes and fitness enthusiasts as well. Today's my post is simply one word. Conducive Learning Environment and Atmosphere. When learning to walk, infants fall many times. These are not failures, but essential lessons that help them learn how to walk. At times, setbacks are an essential part of the change process. Moore, M., Jackson, E., & Tshannen-Moran, B. (2016). Moore, M., Jackson,E., & Tschannen-Moran, B. (2016). Hi guys ! It's Monday and the start of the new week. The rest of 2018 is only three weeks, I would like to enjoy every single day meaningfully. The new word I learned yesterday was " onomatopoeia ", which is a term for expressing a various sound such as bang bang. Among some researchers in exercise physiology, muscle training has been thought as not to directly contribute to benefits on heart health such as reduced risk of cardiovascular disease. However, a new research in this news article sheds light on possible benefits of resistance training on this aspect. It may be a time to change that conventional view. It seems that my English pronunciation in abbreviated forms such as "we'll, you'll, didn't ... etc " are a bit unnatural. Two online language tutors notified me of the problem in the past few weeks. What I need is ... of course practice, although practice may not necessarily bring about 100 percent perfect, one thing for sure is ... practice makes the problem better more or less. This is a practice of foreign language, you know. 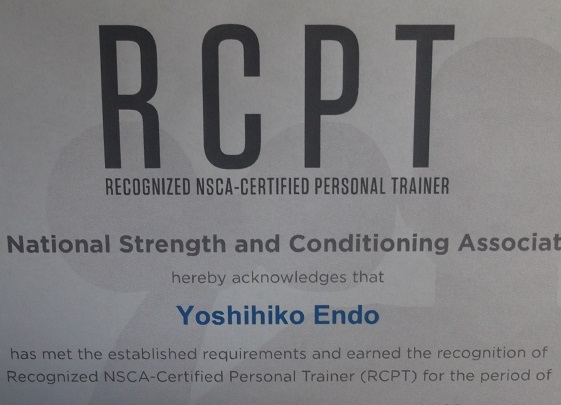 I was watching a webinar of National Strength & Conditioning Association Personal Trainer Conference 2017 as a part of my continuing education, the webinar is about exercise nutrition, and according to the lecturer (phD researcher in chapel hill), the maximum amount of protein the human body can digest and absorb in one time is about 20 grams. What can be inferred from this is ... if your meal is abundant in protein food stuffs such as meat, fish, eggs, soy beans, and dairy products, taking protein powder after the meal would be unnecessary. If you take protein powder, taking it between meals as a small snack would be efficient and reasonable, I think. My throat condition is not so good today and I don't have much energy to complete all exercises in my strength training routine, thus, today's workout is only two exercises, 7 sets of barbell rowing on the bench, and 4 sets of dumbbell pullover. 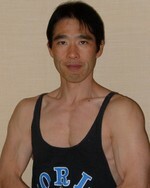 Photos are today's my shape after the workout. Have a nice weekend, guys !